Accutime Visitor Management System provides a simple to use sign-in solution with Photo Capture, Barcode Scanning and Visitor Label Printing. Allows visitors and staff to easily sign in and out of your premises. Accutime Visitor Management System significantly reduces data entry and administration tasks typical of receptions with multiple signing in books. Accutime Visitor Management Stored data, reporting and fire evacuation procedures are supported. Cloud data is available for signing in / out and fire evacuation. This standard Visitor System bundle includes 21.5” touchscreen with a high resolution webcam, thermal label printer, 8gb,back-up, wall or desk mount option. Accutime Visitor Management System provides a simple to use sign-in solution. For instance, the system Includes Photo Capture, Barcode Scanning and Visitor Label Printing. Moreover, it allows visitors and staff to easily sign in and out of your premises. We reduce not only data entry and Reception administration tasks typical of receptions with multiple signing in books, but also support Stored data, reporting and fire evacuation procedures. In addition Cloud data is also provided for signing in / out and fire evacuation. We offer a standard Visitor Management System bundle. It includes 21.5” touchscreen with a high resolution webcam, thermal label printer, 8gb,back-up, wall or desk mount option. We also offer bespoke options for the Visitor Management System. The process and development behind a bespoke system is chargeable. Please Click the for further details. 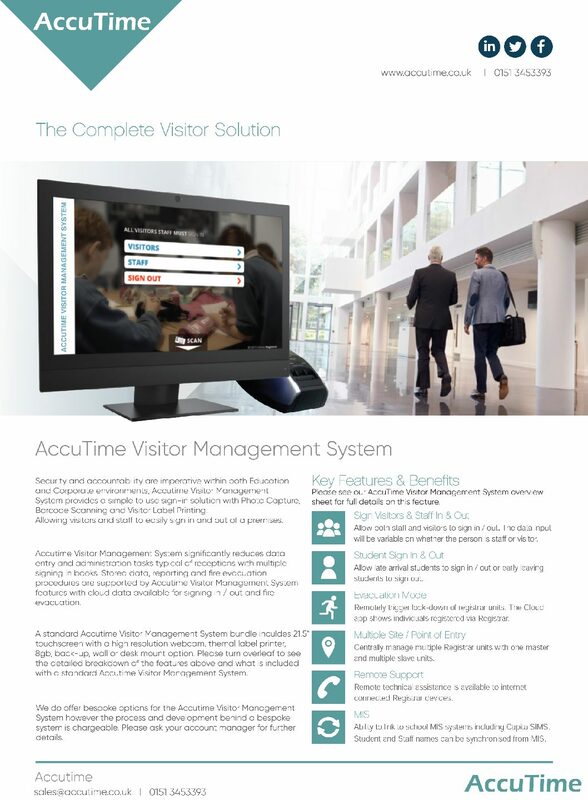 Accutime Visitor Management system allows you to track student arrivals and departures. The Student module is geared around keeping every child safe and secure, as a result this gives you complete peace of mind over pupil whereabouts. We integrate with all the leading MIS providers. Firstly, we ensure that your sign in identity information is always up to date. Secondly, Accutime Visitor Management system will automatically add new year groups at the beginning of the year. As a result, when new staff and students are added to your MIS, they are instantly added to the Visitor Management system. In other words, it makes time consuming manual updates a thing of the past. Other advantages are that student details, staff details, DBS information, staff and student photos and late marks and codes can all be read from and written back to your MIS. What makes Accutime Visitor Management System unique? 1. Can be cloud based or locally based in terms of software. 2. Can link to any MIS system or door entry/barrier system. 3. Can link to payroll software. 4. Remote workers can also log in through a remote app. 5. The front end can be made to fit customer’s needs. 6. Payment can also be made via subscription especially on the cloud. In other words it very affordable. 7. Meet the lastest GDPR compliance requirements in terms of data security etc. 8. There is no need for receptionist and it can be used across multiple sites and mutiple entry/exit points. 9. Convenient and easy to setup and use. 10. Finally, Additional warranty and service contracts are available.